When it was made official a few months back that the next generation Ford Mustang would pack a powerful yet efficient 4-cylinder turbocharged EcoBoost engine, many in the industry began to question whether or not the Chrysler Group and General Motors would follow suit with their Dodge Challenger and Chevrolet Camaro. Chrysler was the first of those two to state that they had no plans to offer a Challenger with a 4-cylinder engine and now Camaro boss Al Oppenheiser has made it very clear that he isnt too fond of the idea of a modern Camaro packing a small, efficient engine. “As long as they’ll pay me to be the chief engineer, I’m going to fight for every horsepower I can and every cylinder I can,” said Oppenheiser while speaking with AutoGuide. Although Ford fans are almost guaranteed to take some ribbing from Camaro fans over the fact that the Mustang is offered with a turbocharged 4-cylinder engine, the advances in Ford’s EcoBoost technology will ensure that these efficient Mustangs still maintain the kind of power that a modern muscle car buyer expects. Rumors suggest that the EcoBoost’d 2015 (or 2016) Mustang will pack somewhere in the area of 300 to 325 horsepower so it will likely be a touch more powerful than both the standard Mustang V6 or that V6 found in the current Chevrolet Camaro but more importantly, the EcoBoost Mustang will almost surely be the most efficient muscle on the market today...if not the most efficient muscle car ever. This likely won’t be a very high take rate model but it will help Ford’s vehicle lineup to better conform to the impending CAFÉ laws for their fleet fuel economy ratings. The good news for General Motors is that over the past few years, they have displayed an incredible propensity for making their powerful V8 engines very fuel efficient without hurting the performance capabilities. The best example is the 2014 Chevrolet Corvette Stingray that is both the most powerful “base model” Corvette ever offered but it is also the most fuel efficient Corvette ever. In addition to building very efficient performance engines, General Motors has continued to find better fuel economy through other channels including transmissions that are better geared for improved cruising fuel economy along with weight reduction through the use of high strength steel and lightweight composites. Thanks to these advancements in engineering and the long list of super efficient models like the Chevy Volt, Cruze, Sonic and more – GM probably won’t NEED a Camaro that gets 35mpg to meet CAFÉ requirements. Of course, there is also the possibility that GM could consider a turbocharged 4-cylinder Chevrolet Camaro…just not in the near future. While it will most certainly make Camaro fans happy to hear that there will not be a 4-cylinder model anytime soon, perhaps Oppenheiser knows that he wont be in charge of the Camaro program in the time frame where GM would like to get a super efficient engine under the hood of their tried and true muscle car. 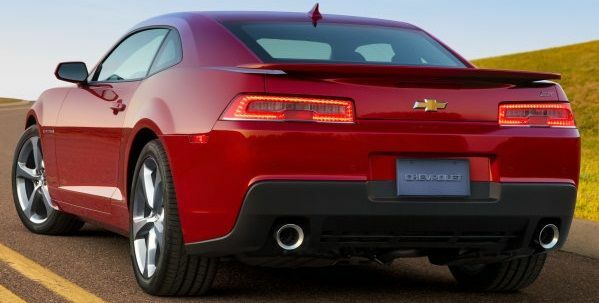 Or maybe – just maybe – GM has something even better in mind to make the Camaro the most efficient muscle car on the market. GM does have among the best electric drive technology and they have used their hybrid technology in the past with the V8-powered large SUVs so perhaps a hybrid Camaro will arrive in the future…or maybe a diesel? OK…probably not a diesel but what about a hybrid? That might seem ridiculous but in the age of fuel economy, automakers are likely to try new ways to offer better fuel economy without hurting the performance capabilities and shy of a little extra weight, there would be little downside to a mild hybrid Camaro SS. Hey, maybe this could get gearheads to finally stop ragging on hybrid owners all of the time!